There are over 100 varieties of Goldfish, but the rarer varieties are usually just a combination of two or three of the more commonly available varieties. You could ask why I only list 15 Goldfish varieties on the website if there are so many. The primary reason is most of the varieties are very rare, seldom seen outside Japan or China. Many of the differences are subtle, and only experts would recognize the significance. For example a butterfly tail on a telescopic eyed Moor makes the fish a different variety from one with either a veil tail (broad tail) or fringe tail. The 12-15 most commonly available Goldfish varieties in the West have endured over the centuries because their physical attributes are well known and obvious. For example, a Comet should have long flowing fins, and deep orange/red coloration. A Water Bubble Eye should have twin tails, no dorsal, and water bubbles under each eye. These "standards" haven't changed for centuries. The number of varieties quickly starts to add up when various attributes from other varieties are added to a fish. An example is the Pearlscale. 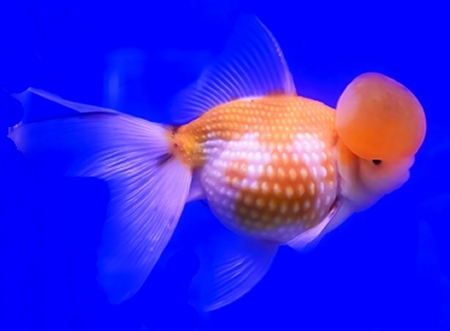 Most Pearlscales seen on the market have no head growth, yet there is a variety with a wen like an Oranda, and anther variety called the High Head Pearlscale (Hama Nishiki) that has two fluid filled domes on the top of its head (see the image above). Pearlscales can also be seen with short fins, long fins or with a veil tail, all considered different varieties. Some varieties are “created” artificially. The Jikin is a long bodied fish with tails that fan out like a peacock’s. This variety should have a white body with red lips and fins. To help achieve this level of perfection, any red scales on the body are removed by the breeder. As mentioned earlier, most of the rarer varieties are made up from one of the core 15 commonly available varieties, with some other physical characteristic added from another variety. Listed below are some of the rarely seen varieties. Some are hard to believe, but I have seen photographs as evidence that they do exist. As you can imagine, any combination is possible, and is only limited by the patience of the breeder, but would a telescopic eyed Pompon Oranda be popular enough to breed commercially? Probably not. The most popular variety in the East is the Wakin, a long bodied fantail bred for its intensity of color. This fish is seldom seen in the West but is as popular as the Comet is in most western countries. Most of the rarer varieties are bred by amateur breeders as there is not enough commercial demand. For this reason newer varieties come and go, and it is the core varieties that remain because the demand is there, and more breeders both commercial and amateur breed them. Some of the newer varieties that do appear to be popular are the panda varieties that have white bodies with black highlights. Unfortunately any black on a metallic scaled Goldfish is unstable as the fish is just going through its color change, and will turn completely white eventually. Many standard varieties are now being produced with black coloration, which was once only present on the Black Moor. Varieties such as Orandas, Water Bubble Eyes and Ranchu are now available completely black. I have started a new test of the water clearing product Splosht. The last test was a total failure, but I did notice the water in one of the ponds change from a green tinge to an opaque brown tinge. Whether this was due to Splosht or something else I don't know. The water temperatures are now 5-6 degrees warmer, and rising, so low temperatures won't be the reason if it fails again. Buy the next e-Zine it will be over 4 weeks since the test started which, by the manufacture's claims, should be enough time to clear the pond.